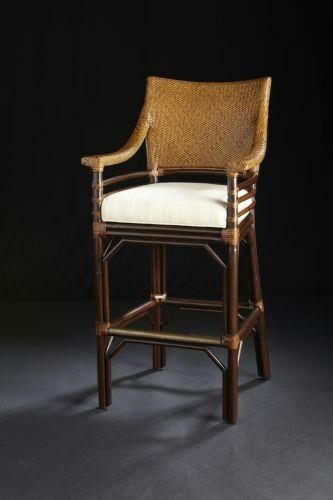 Featuring a woven cane back and natural wood tones, this barstool exudes tropical style. The brass footrest and upholstered seat bring the perfect tailored element to the design for a look of laid-back refinement. The Sahara I Barstool at C. S. Wo & Sons Hawaii in the Hawaii, Honolulu, Oahu, Hawaiian Islands, Waikiki, Diamond Head, East Honolulu area. Product availability may vary. Contact us for the most current availability on this product. Browse other items in the Sahara I collection from C. S. Wo & Sons Hawaii in the Hawaii, Honolulu, Oahu, Hawaiian Islands, Waikiki, Diamond Head, East Honolulu area.